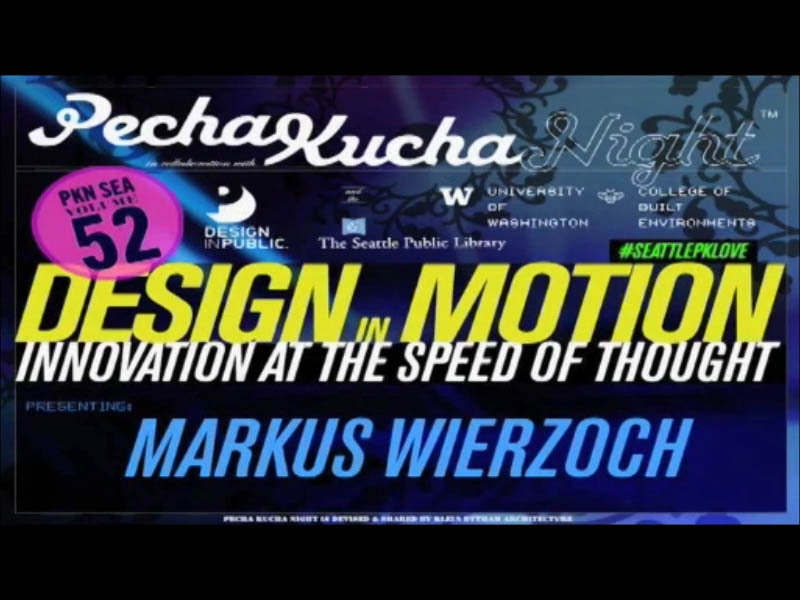 About a month ago, I was among the 13 speakers that shaped Seattle’s 52nd Pecha Kucha Night. I addressed the evening’s theme of “Design in Motion – Innovation at the speed of thought” by illustrating how the use of frameworks in innovation processes not only accelerates the generation of ideas, but also improves the quality of concepts. Juliette Delfs speaks about the inspiration behind Hub and Bespoke – her store that supports city bicycle commuters in Seattle with apparel and accessories that are both functional and fashionable (fast forward to 14:49). Teague‘s Devin Liddell gives an entertaining talk about heroes and villains in the world of design and innovation (22:00). Dr. Tom Daniel of the Unversity of Washington’s Biology Department shows how biomimicry is connecting the worlds of design and neuroengineering (44:36). Jody Medich of Microsoft captures the essence of natural user interfaces and points at would could come next in the field (59:46). Being the last speaker of the evening, you will have to skip all the way to 89:36 to watch my session, or alternatively you can view the video below… enjoy!